The Informer wouldn’t mind betting that a good number of his readers are Twits; assuming, of course, that ‘Twit’ is the noun employed to describe people who frequent the Twitter social networking site. The Informer is a Twit himself, through www.telecoms.com, so you’re in good company. Twitter is gaining traction in a big way; and not just from the bottom up. The Informer has heard of more than one company in the industry that has made Twitter accounts mandatory for employees, teams or working groups. Posting 130 character updates is becoming an obsession for these people – but are they right to be so enamoured of it? Certainly there are those who believe that Twitter serves principally as a delivery mechanism for the most slack-jawed inanities the human brain is able to conjure; content comprising the kind of thoughts that Ma Nature intended to remain safely within the cranium. Whatever useful, interesting information might be available on Twitter, these people argue, is obscured by a clamour of bird-brained vapidity that is perhaps most effectively represented by the seagulls from Finding Nemo. The Informer met up with an industry chum this week who was fresh from a board meeting at a prominent handset organisation. 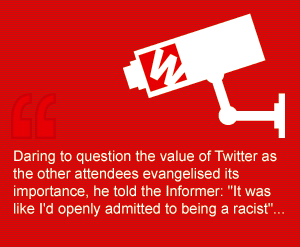 He had dared to question the value of Twitter as the other attendees evangelised its importance. His point of view, he said, stunned the room into awkward silence. Clearly still taken aback at the reaction he’d drawn, he told the Informer: “It was like I’d openly admitted to being a racist”. So, do you work for a company that makes you tweet? If so, the Informer would like to hear from you – and you are not limited to 130 characters. Twitter can at least lay claim to being the current ‘big thing’ and, this week, a group of clever people from the UK’s De Montfort University were given the task of predicting a service that will usurp it in a bid to foretell what ethical pitfalls might arise. Internet banking spawned phishing, for example, and the rise in social networking sites has resulted in worrying amounts of personal information being made openly available – as well as causing the characters ‘lol!’ to appear inexplicably at the end of every single statement like some kind of involuntary grammatical spasm. Nope, the Informer didn’t understand it either. The fundamentals are not strong enough, though, nor the momentum accelerating at a sufficient rate to persuade Donahoe that holding onto the VoIP carrier is a good idea. “It’s clear that Skype has limited synergies with eBay and PayPal,” he said. The firm plans to IPO Skype in the first half of next year, although specific timing will be decided by market conditions. In related news, Skype said this week that one million people downloaded its Skype for iPhone application in the first 36 hours of its availability in Apple’s App Store. In just over a week, downloads passed the two million mark, putting Skype on more than six per cent of all iPhones and iPod Touch devices, and adding almost half a million new Skype users. Google was in the news this week with its Android OS, giving developers a peak at the next generation of the platform. According to a posting on the Android developer blog on Monday, version 1.5 of the OS introduces APIs for features such as a soft keyboard that works in both portrait and landscape orientation; home screen widgets such as an analogue clock, calendar, music player, picture frame, and search; live folders; and speech recognition, bringing some much wanted functionality to the Android device portfolio. Sticking with handsets, the financial crisis was expertly illustrated by Nokia this week, which reported a 90 per cent drop in profits for the first quarter. The Finnish firm reaped E122m, down from E1.2bn in Q108. Net sales fell 26.7 per cent year on year to E9.3bn, from Eur12.7bn. As estimated industry mobile device volumes sank 14 per cent year on year to 255 million units in the first quarter, Nokia’s own mobile device volumes dropped 19 per cent year on year and 18 per cent sequentially to 93.2 million units. Nokia attributed this partly to carriers running down inventory – either way, the firm’s market share, by its own estimations, dropped two points to 37 per cent. ASPs dropped to E65, down from E71, but the company reported strong sales of its touchscreen 5800 product, which surprised the Informer somewhat, because he thought it was a bit ropey. Nokia shipped 2.6 million of these phones in Q1, with cumulative shipments of more than 3 million units since the device’s launch in late November 2008. These results are what counts for rosy news in the handset space, though. It’s not looking quite so good for Sony Ericsson. A further 2,000 jobs at the firm are for the chop as Q1 shipments were down 35 per cent year on year to 14.5 million units, with the firm blaming de-stocking, like Nokia. But Gartner’s handset market specialist Carolina Milanesi suggested that Sony Ericsson’s portfolio should also shoulder some of the blame. “Imaging and music are now part of most of the competitors’ portfolios, and Sony Ericsson is finding it more and more difficult to have its products standout,” she said, before tapping another nail into the coffin. “The ‘idou’ device presented in Barcelona is certainly a step in the right direction for Sony Ericsson but one cannot help but wonder if it will be too little too late given it will only be on the market at the end of the year.” Eek. Chip maker Intel took a quarterly kicking as well, with profits down 55 per cent year on year to $645m. There was particularly bad news in the firm’s mobility division, where operating income dropped to $267m from $934m in Q108. Net revenue at the unit dropped from $3.5bn last year to $2.9bn in the first quarter of 2009 and the company said that revenue from its Atom microprocessors and chipsets was $219m, down 27 per cent sequentially. Over the fence from Intel’s WiMAX community is Camp LTE and this week Nordic carriers Tele2 and Telenor revealed that they are joining forces to build an LTE network in Sweden. The partnership will see the establishment of a joint venture company for network construction and sharing of spectrum. Infrastructure roll out will start later this year with the companies intent on launching mobile internet services towards the end of 2010. By 2013, the two operators expect 99 per cent of the Swedish population to have access to mobile internet at speeds of up to 80Mbps in rural areas and up to 150 Mbps in urban areas. The Informer could really do with a story about CAMEL here, or something about a pyramid scheme, because he desperately needs a link to help him get to Egypt, where the tug of war over local carrier Mobinil gained intensity this week after regional (and Egypt-headquartered) carrier Orascom failed to transfer its holding in the company to purchaser France Telecom. Orascom argued that it was unable to transfer the shares, as ordered by the International Court of Arbitration of the International Chamber of Commerce, because France Telecom filed to pay the agreed purchase price for the stake. The Egyptian carrier is also trying to force France Telecom to extend an offer to buy out the minority shareholders in Mobinil, although France Telecom’s attempt make this move was scuppered by the Egyptian Capital Market Authority (CMA) last week, which sided with Orascom and said the offer was not good enough. On the other side, France Telecom has hit out at Orascom, claiming that the Egyptian firm is engaging in a media campaign to swing opinion over the dispute. The French company also says that Orascom is risking a $50,000 a day penalty (beginning April 10th) for failing to complete the share transfer. Why can’t they just play nicely?